We've never met anyone who's a peanut specialist, but it probably is an actual occupation somewhere in the depths of the food/allergy/nutrition world, although it would be a stretch to imagine that someone wanted to grow up to be one. 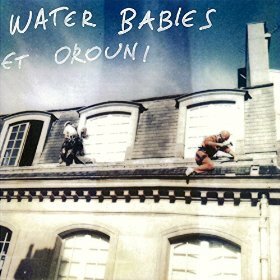 Still, French girl group Orouni recorded a song of this title for a recent split single with their friends in Water Babies. A very nice piece of indiepop it is too, sounding not dissimilar to a lot of UK DIY groups (they state that a love of British pop was common ground between the two bands). As well as that, there's an electronic element, and combined with the slight accents to the vocals, this makes Stereolab an obvious comparison. 'The Peanut Specialist' is less experimental than Stereolab though, but it's not exactly run-of-the-mill and contains plenty of points of interest. There's a strong melodic element and lyrically it's far from normal in subject matter. Orouni have written a lot about experiences of travelling around the world for a year, so unusual cultural references are common in their music. The video to this track was filmed in Jardin des Plantes, Paris, and is full of the joys of summer - something that looks very far away as we peer out at grey, dark skies. It's a welcome piece of escapism in more ways than one, and marks out this band as being interesting and individual. Probably the best song about peanuts since Gorky's Zygotic Mynci released 'Peanut Dispenser' over twenty years ago. The Sound Of Confusion is a new music radio show and blog. Indie, shoegaze, post-punk, indiepop, garage, electronica, alt-rock, new-wave, psychedelia, dreampop and more. Tracklistings and past shows on Mixcloud.